We estimate that Perry went through 30-40 leaf/dormancy phases before flowering (note: the error bars on that estimate are large). This message connects some photos from fairly recent years (scroll down for thumbnail links to those photos), when Perry was beginning to attain her/his gargantuan character (she/he was simply a potted plant…but a special one…before the macroscopically obvious onset of the genetics of gigantism). 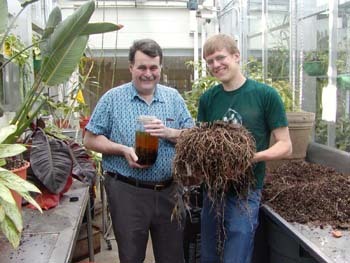 We knew, from an academic perspective, that this plant would become gigantic, but the reality (i.e. “Oh – it really is becoming gigantic…!”) became more and more riveting, especially when it began to routinely heave itself partly out of the largest pot that we could obtain, again and again. Sort of like one of those cheesy science fiction movies from the 50’s and 60’s, but real. 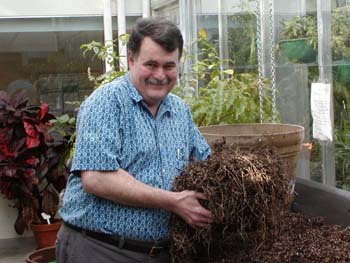 Normally, when one needs to obtain a bigger pot for a plant, that can be done. 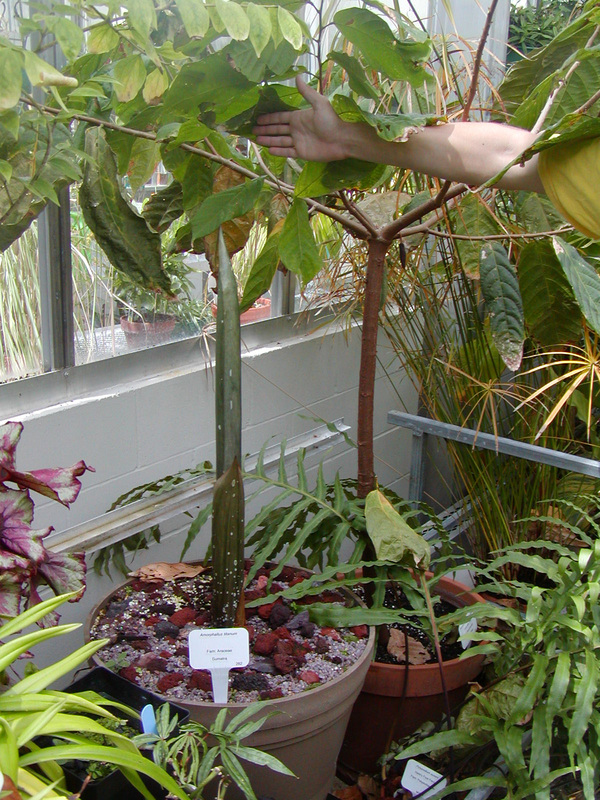 The steadily-increasing pot-desperation of growers of Amorphophallus titanum is, however, something that is rarely experienced by other growers of plants in Zone 4. Plans were made, materials were bought (my idea was a big cedar enclosure, until it occurred to me that, yes, wood is brittle and unable to resist the onslaught of pressure within this context…). 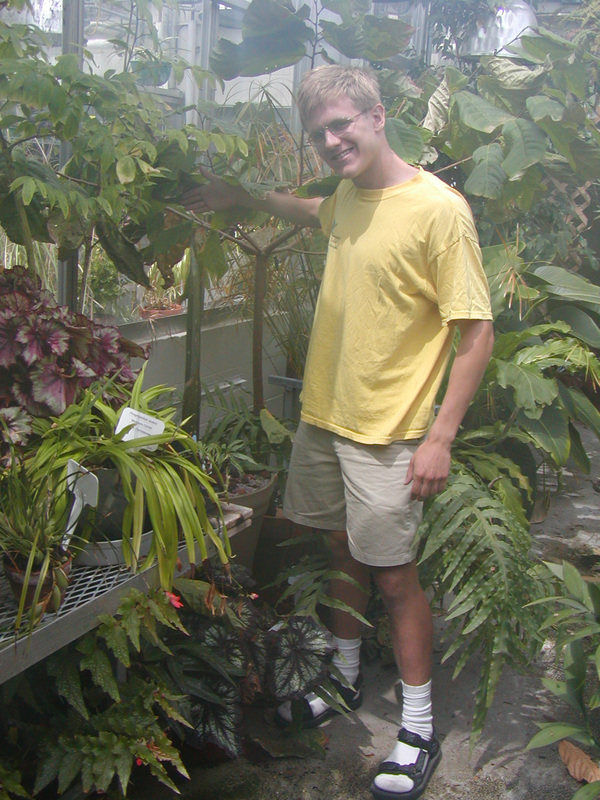 Pictured are various combinations of Perry, Jim Eckberg (one of my series of Plant Students – one such student usually exists, and, upon graduation, a Successor appears…) and Your Friendly (within certain limits) Blog Moderator at earlier times. 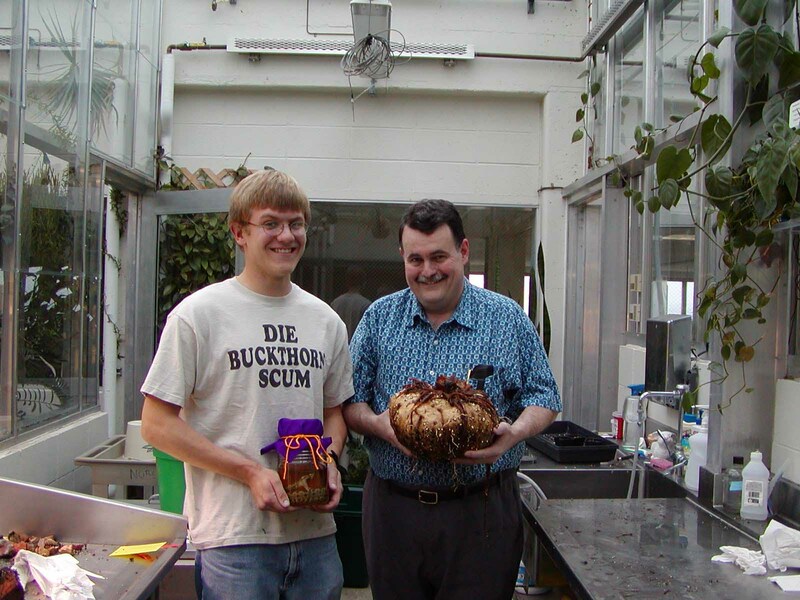 A human cultural note: the phrase on Jim’s shirt, “Die Buckthorn Scum”, is not the name of a German avant-garde/whatever band (as had been assumed by at least one person). 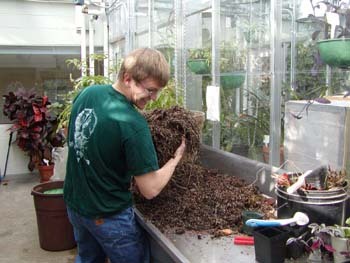 It is a literal statement of Jim’s extreme animosity toward buckthorn, which is an invasive species in Minnesota. 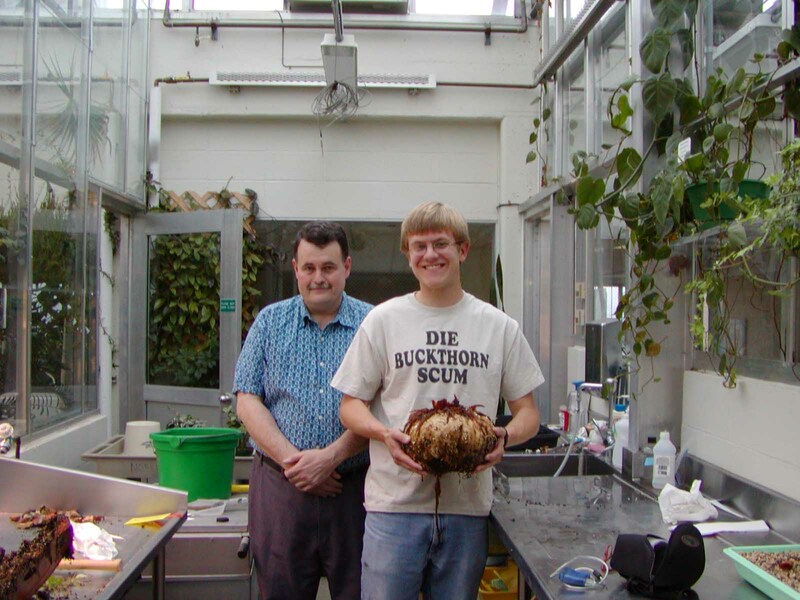 He has, in person, participated in a massive way in eradicating this vegetable monstrosity from the face of all of Minnesota earth. 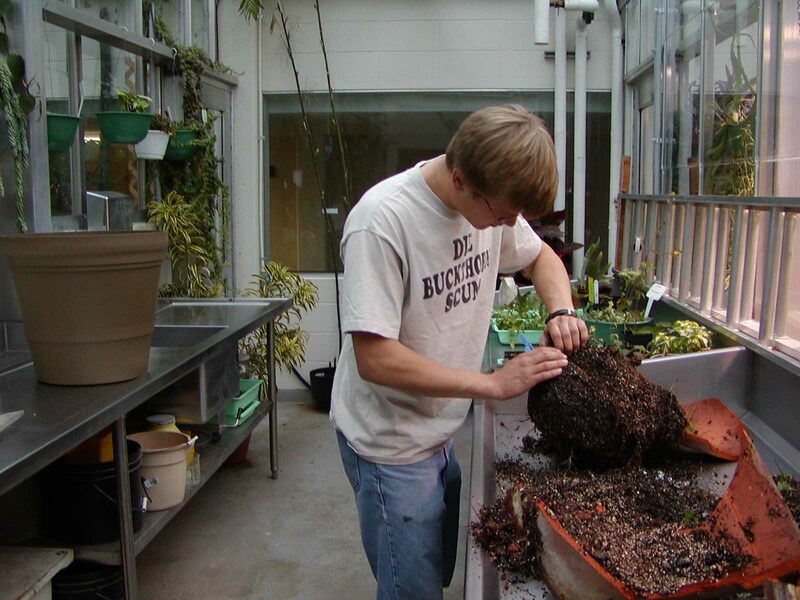 Note the happy and carefree nature of the handlers of a 30-pound-or-so corm in the 2004 photos. We were astounded at its whopping big size. See now the earlier post on this blog, in which Alex briefly tries to hoist the 90-pound corm, and also notice the happiness tinged with bemused astonishment on all of the human faces. you did something so amazing. 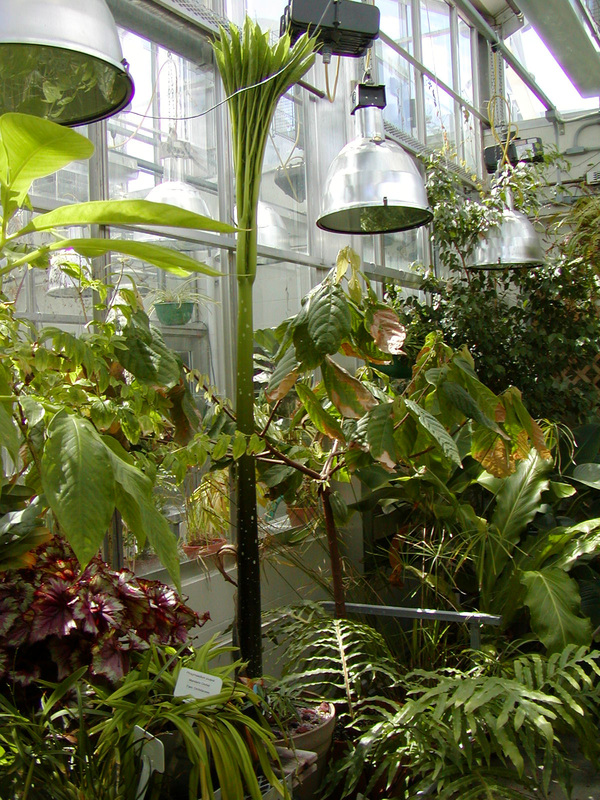 I didn’t follow all of the happenings but I was able to see the corpse plant on 5/13/07 and was glad for that experience. Thank you for sharing the whole journey of it. Thanks much for your kind words, and I’m glad that you were able to participate in the event. 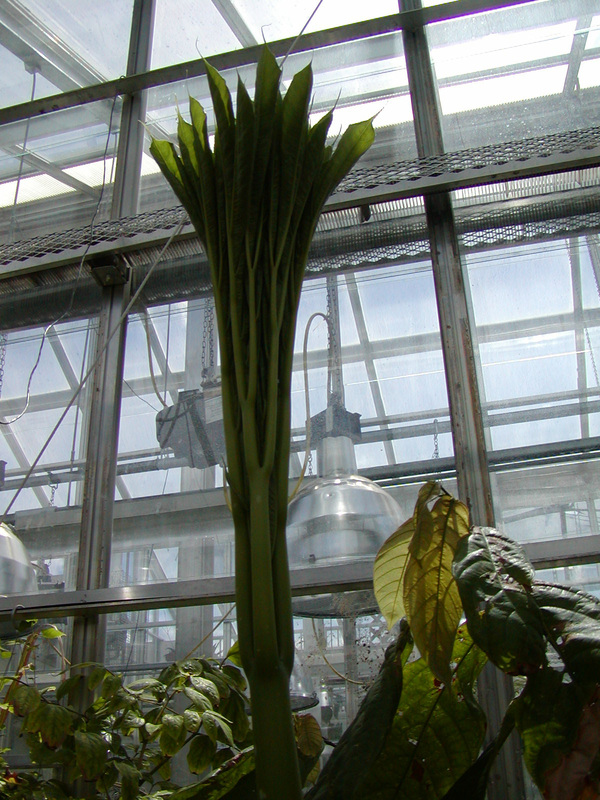 Things are still percolating along here (as they have been for many years) with regard to Amorphophallus titanum – we’re now watching the near-final stages of senescence of the inflorescence while awaiting the appearance of the next leaf. I was out of town when the plant bloomed. Is there a site I can see it blooming? These are fascinating to inspect, one by one.